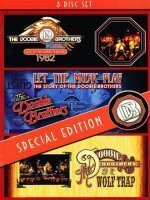 This Doobie Brothers three-disc set brings together two concerts and a documentary, all previously released separately. This is either an ideal introduction to the band or a trip down memory lane for long time fans. 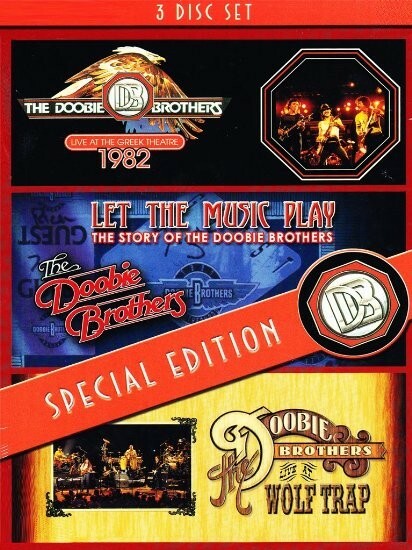 'Let The Music Play' is the story of The Doobie Brothers, where current and former members of the band talk about their contributions to the group, and is interspersed with archive clips of various performances. Although little 'dirt' is offered on the band's history, it's still a fascinating story of one of America's most beloved bands, one that has been Rocking for over forty years! 'Live At Wolf Trap' was filmed in 2004 and features twenty-three songs plus three bonus tracks as well as extra interviews and is recorded in 5.1 surround sound. This line-up was minus Michael McDonald and is the more Hard Rocking version of the band. Sadly it does omit many of the songs from that period – the exception being 'Taking It To The Streets'. 'Live At The Greek' was their 1982 farewell tour offering and by this time many members had come and gone, thus allowing McDonald to forefront the bands song-writing with his more Soulful approach. It's a truly legendary show filmed at the Greek Theatre L.A. and again is delivered in 5.1 surround sound. The final song 'Listen To The Music' features former members Tom Johnston, John Hartman, Michael Hossack and Tiran Porter, all joining the band on stage for a truly Rocking finale.